It consists of the three "Pinakotheken" galleries (Alte Pinakothek, Neue Pinakothek and Pinakothek der Moderne), the Glyptothek, the Staatliche Antikensammlung (both museums are specialized in Greek and Roman art), the Lenbachhaus, the Museum Brandhorst (a private collection of modern art) and several galleries. Also the Staatliche Sammlung für Ägyptische Kunst (the state collection of Egypt art) was moved to the Kunstareal in 2013. 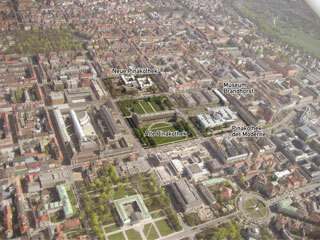 The history of the museums in this area of Munich began in 1816 with the erection of the Glyptothek at Königsplatz and was completed with the new building for the Egyptian Museum (2012) and the extension of the Lenbachhaus (2013). This article uses material from the Wikipedia article "Kunstareal", which is released under the Creative Commons Attribution-Share-Alike 3.0 License.